Brandon University President Gervan Fearon speaks at the Brandon Chamber of Commerce Luncheon at the Royal Oak Inn on Thursday, March 10, 2016. BRANDON, Man. – The President of Brandon University (BU) thanked the local business community today for their support and for rallying behind the BU Bobcats as they prepare to host the city’s first-ever Canadian Interuniversity Sport (CIS) championship. 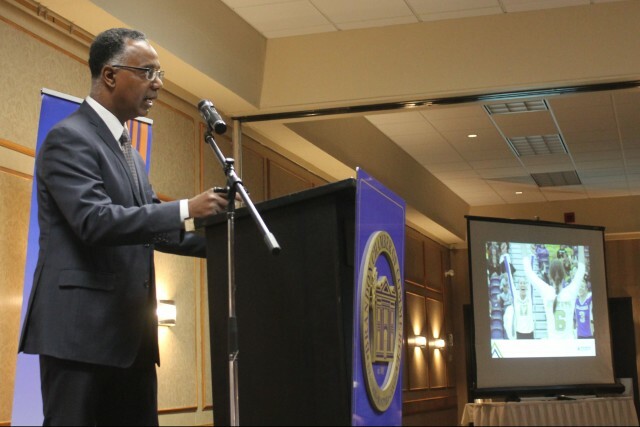 University President Gervan Fearon spoke to the Brandon Chamber of Commerce on Thursday, the day before the CIS Women’s Volleyball Championship begins at BU’s Healthy Living Centre (HLC). Matches get underway Friday afternoon, with the BU Bobcats facing their first test at 6 p.m. The efforts of Brandon First helped BU land the championship, which will bring in seven top teams from across Canada to compete with the host Bobcats. Businesses have been digging deep to support the event with $30,000 in sponsorship, and their contributions will help fill the expanded-capacity HLC, with 1,600 school children from across Westman taking in Friday afternoon’s matches. In turn, the championship will provide an excellent bump for the local economy. The visiting seven teams are spending nearly a week in Brandon, with the players, coaches staff and their fans staying in city hotels, eating in restaurants and shopping in stores. Three of the teams are flying in and out of the Brandon Municipal Airport on WestJet flights. “I hope to see everyone at the Healthy Living Centre, cheering on our Bobcats and celebrating what we have accomplished together. The entertainment and inspiration provided by our athletes can be shared by all of us and represent the way we all can win as partners,” Fearon said. The BU Bobcats hit the court for their first tournament test on Friday at 6 p.m., as they take on the top-seeded Trinity Western Spartans. Semifinals are on Saturday, with the final gold-medal matchup set for Sunday at 6 p.m. Tournament packages are still available at just $60 for adults, and a package of any two matches is just $20. They can be purchased at the Healthy Living Centre or online at gobobcats.ca/nationals. Get yours now! The Bobcats won a dozen straight matches to end the regular season, setting three school records and breaking two Canada West conference records in the process.